Wow ... this is where 'the source' of action stems from on a pirate ship ! But "someone" has scrubbed those floors clean ... because I cannot imagine it would "always" would have looked that neat, shiny and orderly ! Heh -- maybe their Captain was - meticulous in cleanliness and organizational skills ... hence -- "a place for everything, and, everything in its place" !!! Of course ... a pirate ship would be "expected" to be ready at all times ! I'm impressed ! This is so cool! I agree with Brenda about the neatness. Men usually have a tendency to make things messy. :) But this is still awesome; I really like to look at pictures of ship parts! Really cool pic! 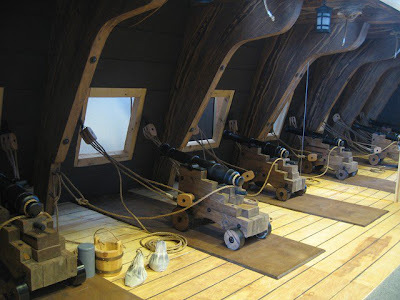 But just out of curiosity, how many guns would the average pirate or privateer ship have? and where would they keep the cannon balls? LOL. No ships were normally not this clean. Well, British Navy ships might have been close to this, but not regular merchant, privateer or pirate ships. (Not unless a woman was on board to clean up after the men! LOL) Anyway, to answer your question Eszter, it depends on how big the ship was. Most pirate ships were quite small because small ships were fast and they needed to be fast to both catch and escape from their prey. Merrick in my first book, The Redemption, had 12 guns, I think on his brig. Compare that to some of the massive ships of the line in the Royal navy that held up to 80 guns! Cannon balls were piled up next to the guns and the rest were kept in what they called the ship's magazine where all the gunpowder was kept. Hey MaryLu, me again. I just wanted all of your fans/friends to know that if they ever need someone to pray for them, I am a volunteer member of the Guideposts Personal Prayer Response Team. So, if you or anyone else has a prayer request, just send them my way. You can use this email address: debsbunch777@gmail.com.....God bless you all. Heh again, MaryLu. Sorry, I just "now" (minutes later), saw Debbie M's posting re: 'The Guideposts Personal Prayer Response Team'. Debbie ... you have my personal permission and blessing to -- prayer for my Jeff ! He "needs" all the prayers he can get, going UP on his behalf !!! Thank-you, and, God bless you ! MaryLu, I received my book today. Thank you so much. I appreciate it more than you know. May God bless the rest of your week. @Brenda: Will do! Oh, that's so kind of you, Debbie, to offer your prayer group up to Brenda and others who follow my blog. I'm a firm believer in the power of prayer!! Glad you got your book! And, Brenda, I hope you enjoy The Redemption all over again! It's one of my favs... love Merrick! Ah, yes, the smell of gunpowder! Thanks Sapphire. Love these pictures; keep posting them!!! Just finished TRedS and TBE and the pics help me "see" better some of the things you wrote about! However, don't really like the picture. As you all said above -- to clean! Thanks Jackie! Glad you're enjoying Charles Towne Belles! And I agree Abigail about the cleanliness. Apparently they hired a maid to clean up before snapping this shot. LOL. I have other, more realistic pictures coming.